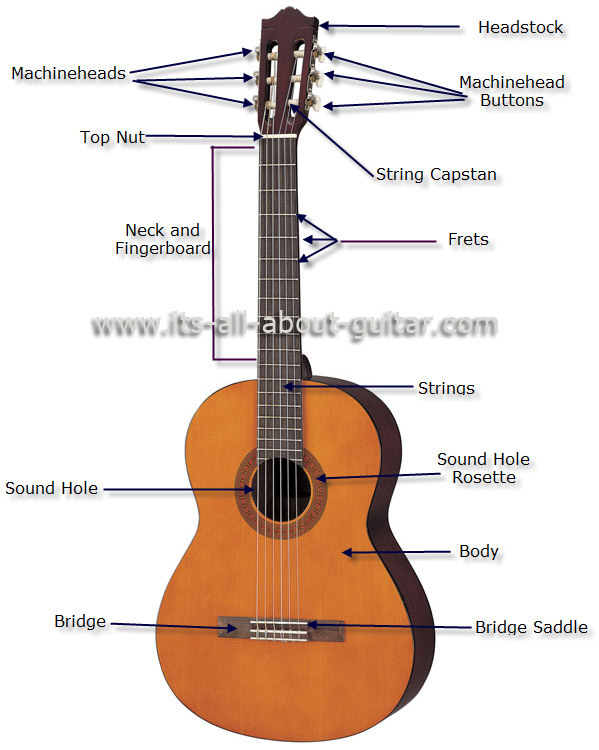 This diagram of a nylon string guitar shows it's main composite parts. The nylon string guitar, also known as classic, spanish, or flamenco guitar, are acoustic instruments strung with nylon strings rather than steel strings. Played using the fingers (fingerstyle) rather than with a plectrum the top three strings (i.e. 1st 'E', 2nd 'B' and 3rd 'G') are plain nylon. The three bass strings (4th 'D', 5th 'A' and 6th 'E') are also nylon, but bound with a fine plated wire. Nylon strings help to give the delicate and sweet tone associated with these instruments. They are also available in various sizes from 4/4 (full-size), 3/4, 1/2 and even smaller sized instruments.